A multi-award-winning comedy about a gray little man who, when diagnosed with a terminal illness, hits the road desperate to find some meaning in his life. At a broken down motel in the middle of nowhere, he accidentally stumbles upon the one great love of his life. Fireworks ensue as Love and Death, personified with glorious irreverence, battle for the soul of Charlie Cox. With warmth, humor and humanity, Charlie Cox Runs with Scissors shows how sometimes all it takes is a little death to show us how to live. "A joyous, uplifting work from a playwright who gets better with every story he tells." "Rife with wit and humor . . . the ending makes you feel good without assaulting you in a hallmark sort of way. Highly recommended." "A poignant treatise on life and love." 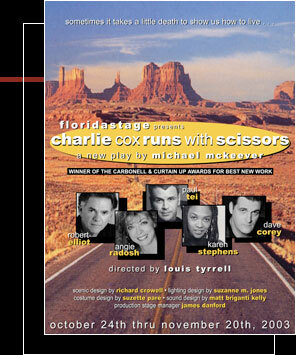 "Charlie Cox Runs with Scissors is damn near perfect." 2003 Palm Beach Post "Top Ten Plays List"
for the published script, please go to dramaticpublishing.com.